Private 1:1 business mentoring and personal coaching to help you piece together the business that’s right for you. A 12 week collaborative partnership for those of you who want to unlock your potential, unleash your dreams and kick-start a brilliant new way of living and earning through the creation of a business of your own. It’s a funny feeling, isn’t it….. that mix of anticipation and fear? Because you KNOW you’ve got something important to share with the world but there’s one voice in your head telling you to take the leap and ‘just do it’ and another warning you to move away from the edge! It’s like being permanently poised at the start of an adventure, unable to actually move forward. Of course it is…. because it’s so much MORE than ‘just’ a business isn’t it? It’s also an amazing opportunity to unlock your potential and transform your lifetime’s experience into something valuable and purposeful. A chance to make a difference and earn a living doing something that makes your heart sing. It’s an exciting time and it’s a vulnerable time. It’s fair to say that the clarity and confidence you’re looking for is infuriatingly illusive and as a result you can so easily find yourself immobilised by a rising sense of panic at all the decisions ahead of you! You feel frustrated and overwhelmed because you’re just not sure what you need to DO in order to make those dreams a reality. Inside you KNOW that there IS a way to do this but right now it feels like you’re trying to complete a jigsaw puzzle with an odd selection of seemingly random pieces and no picture on the box! I get that, I really do. I’ve been there too, not knowing HOW to make it all fit together, desperately wanting and trying to force the pieces into some sort of shape. But of course, it doesn’t work without that all-important ‘picture on the box’. And then what happens? Well, you find yourself wondering if maybe this isn’t such a good idea after all and before you know it, what once felt like opportunity and potential is replaced by a sense of deficiency and resignation. But since you’re reading this, I’m hoping you’re ready to change all that. So check in to see if this is what you’re looking for. You have plenty of ideas (or half-ideas!) but they’re mainly just bumping into each instead of going in any particular direction! You want to put all the pieces of your particular puzzle together into something viable and enjoyable with a simple, doable strategy for success to underpin your business aspirations. And you’re looking for guidance, encouragement and support rather than struggling along trying to do it by yourself. It’s also for you if you’ve been in business for a while but are still struggling because the key pieces are missing and you find yourself well and truly STUCK before you’ve really got started. For you, time spent addressing the essential fundamentals and getting things properly established and on a firm footing will be time well spent. The single most important piece of business advice I’ve ever been given is this: keep it simple. And it’s advice I’ve taken on board and incorporated into my own business and placed at the heart of my coaching. I know that it FEELS like there’s a million things to do and it’s natural to want everything to happen RIGHT NOW when you start out, but here’s the thing to remember – it’s not about trying to ‘do it all’ – it’s about concentrating on the things that will make the biggest difference and at THIS tender stage you don’t need to know the next 325 moves – just your next 6 steps! Without these fundamental things firmly in place you’ll NEVER get the business building results you so desperately want. I’ve seen many a new business owner struggle simply because they headed straight into things like designing a snazzy website. But because they didn’t HAVE the fundamental things in place, they found it really hard. They didn’t know WHAT to say, WHAT they were offering or WHO they were even talking to, which meant they fumbled around aimlessly and ended up taking much LONGER to get things off the ground. It’s a bit like splashing out on a gorgeous, exotic plant and finding out later – when it’s wilting and looking pretty sorry for itself – it’s because it’s in the wrong soil, the wrong container and the wrong position! And, just like a plant, it’s what’s hidden from view that so often determines if your business will take root and flourish. I take the results of my clients very seriously and I see absolutely no point in burdening you with things that just aren’t necessary. In my experience, simplicity has an enormous power: the power to cut through overwhelm and reveal the clarity, focus and actions that will enable you to quickly bring your prime time business to life. Before we started working together I was stuck in a hole both personally and professionally. I had a broad idea of my niche & where I wanted to go & no idea how to get there. I was ready to go out & do this thing, but was feeling frustrated & unmotivated because I didn’t know how to do it. As soon as we started to work together it felt like a weight had been lifted from me, your natural warmth, confidence and competence gave me the assurance that you knew what to do & how to make it work. You’ve challenged me & pushed me beyond my comfort zone, (so many times & so far that I don’t know where it is any more – thank you). You’ve been really supportive & encouraging. You knew what I needed in terms of feedback (especially when I wobbled), and celebrated my success. You held me to account, gave me things to do, were a great sounding board and have enthusiasm for what I am & can do. We’ve had fun. And equally important I have the belief & confidence that I can do it, I’m focused, inspired & motivated and I’m now ready to go into the arena, do the best I can, being my authentic self. When I contacted Karen I had recently qualified as an AMATSU practitioner and having got this amazing new skill and all this knowledge, I wanted to ‘get it out there.’ I wanted as many people as possible to benefit, as I have. I spent months floating around working with a couple of clients…. waiting for ‘the right time.’ And when a ‘right time’ presented itself I became totally overwhelmed by the enormity of turning this into a proper business and so frustrated with myself for not knowing where or how to start. Having always been employed, I’d never had to make these types of decisions before and I needed someone to, not only help me make the decisions, but then hold me accountable for actually doing it. Working with Karen gave me this much needed accountability and helped me to move out of the procrastination that had kept me well and truly stuck. I have been able to move from ‘perfect inaction’ to imperfect action! In the last few months, Karen has helped me break down that once huge, seemingly impossible thing, into many, tiny baby steps, each of which were doable and, just like walking, I’ve now got into a momentum where things are now just flowing quite naturally. My mind-set has totally changed too – once I became open to the idea that it CAN happen… it just did! The very first step is for you to get a sense of where you are and where you want to go in terms of what you really want to create – both in your business and your life. This simple prep form helps you make a start even before our first session. It’s designed to encourage your creative thinking and gently ease you into the process, ready for your Kick Start Session. As an ex-teacher I know how important it is for you to get the guidance and support that’s right for YOU so we start off with a 90 minute telephone/skype conversation* where together we’ll map out exactly how our collaboration will work best for you and get the ball rolling at the very outset. In-between our calls you’ll have small, focused tasks to complete to consolidate your thinking and keep you moving ever forward. These are especially designed to be creative, enjoyable ways of doing all of the ‘traditional’ stuff by leveraging your intuition, experience and instinct. Support, accountability and motivation are perhaps THE most crucial, yet often under-valued part of any coaching relationship. You’ll have me at the end of the phone (or Skype) for urgent or quick questions in between sessions and you can access unlimited email support (during the week). It’s very much a collaboration and together we’ll ensure you see your ideas through to completion. The overall investment for your 3-month coaching package is £500+VAT per month. Bringing a business to life is an ever-evolving process so there’s no hanging around waiting! There’s a fair amount of exploring, learning and clarifying to do but this is also very much an experiential journey and you’ll be implementing right from the outset because all your seriously brilliant ideas and wonderful intentions will only benefit you, your clients and your business IF they are implemented! Having ideas is easy… following through to bring them to reality is what really matters and that’s where ongoing support makes all the difference. I’m totally passionate about the value ‘business’ creates for older women – on a personal level and for society at large and I delight in using my experience to help creative and passionate women make their mark on the world. This is NOT a generic business start-up programme – this is about the two of us working in collaboration to ensure you create a business on your own terms, doing what you love. It’s been designed specifically to help you step into your dream of starting a first-time business by providing a simple structure to help you focus and direct your efforts and get things properly established and on a firm footing at the outset. It’s also pretty unique in that it works with you on BOTH the personal and the business challenges ahead because make no mistake, the two are completely interlinked – your mindset and self belief play an enormous part in your business success. This programme combines inner clarity with outer action – the most powerful combination I know! 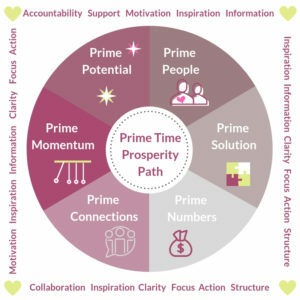 My background in business, training and coaching makes me particularly well placed to help YOU navigate the internal blocks as well as the practical ‘how-to’ elements necessary for your business success. Ideas and good intentions aren’t much use to anyone if they never get to see the light of day, so everything you’re currently NOT doing is at a cost to your future potential income and lifestyle. It makes sound financial sense to get clear and focused on selecting and initiating the right actions and the right strategies at the outset so you know you’re headed in the right direction with a route map to get you there! I’m confident that you’ll be delighted with this programme but I want you to feel confident that you’re investing your time, money and energy wisely, which is why I offer you my personal guarantee. My promise is to deliver high quality training, advice, solutions and support to you throughout this journey and I am totally committed to making sure your expectations are not only met but exceeded. I am also committed to you taking action and my guarantee reflects that. So, if at the end of our first month together, you have attended our scheduled sessions and taken action on the steps you committed to and you’re not completely satisfied, then I will give you a 100% refund. So you have nothing to worry about. Let’s have a conversation! I never rush anyone into a decision, and I wouldn’t expect anyone to commit without having had a private chat with me first, free of charge and free of obligation. I can find out more about you and your business dreams and you can ask any questions you have and together we can decide if this would be the best support for you. I 100% understand that making this type of investment in your business is not always easy – particularly when you are just starting out. I want you to feel confident that working with me is a smart decision so, rather than bookmarking this page for later, in the hopes that you will one day be able to take the leap to hire a coach, I want you to submit the form below to book a discovery call with me. By submitting this form, you’re simply telling me that you’re truly interested in working together… you’re not committing to anything, apart from finding out more! So please, if you’re raring to go… OR you still have some questions… OR you’re just not sure, the next step is the same, simply fill out and submit the form below. Let’s get to know one another before you make a decision. I would love to learn more about you and your mission and help you get your business up and running with simplicity and ease.